For the western mind, the language of yoga and other spiritual paths is many times difficult to decipher: the symbols and metaphors are a jungle where both initiates and (mostly) uninitiates are lost. The hidden key that opens all these secrets and lost meanings is Resonance. Resonance is very easy to understand for the western mind, so much centered on the scientific approach of reality. In the light of Resonance, all metaphors and symbols immediately start to make sense, becoming in the same time a genuine door toward invisible realities. The Law of Resonance has a relational character, i.e. expresses the way in which two or more apparently different things or phenomena selectively communicate (are linked), being integrated into an unitary Whole. The links which unite all things in the Universe (physical objects, mental processes, psychic phenomena, spiritual levels, in other words everything manifested) have as basis the process of Resonance. The fundamental secret of yoga practice is to create and maintain a process of resonance, in other words a process of initiating and amplifying a vibratory response (a link) in a receiving system that is attuned to an emitting system. It is very important to understand that resonance starts only when the frequency of the two systems (the receiving and the emitting) are very close or identical. In yoga, the process of resonance is created and maintained mainly by permanently focused attentiveness (effortless mental concentration). During resonance, the cosmic frequencies (vibratory energies) that are continually emitted as cosmic waves by interstellar centers, galaxies or planets can be received by the correspondent foci of the human subtle body in the same way that a radio set can be tuned to different radio frequencies. During resonance, a transfer of subtle energy takes place, from the emitting source to the receiver. The received energy brings with it all the characteristics of the source, on multiple levels (physical patterns, specific energy, feelings, inner states, information, ideas, etc). What has yoga to do with resonance? Here’s what: all yoga techniques (asanas, pranayama, meditation, etc.) are accurate modalities to create resonance with certain cosmic energies that are specific for that particular technique. The type of energy that a certain technique resonates with is revealed by a guru (and who knows that information through direct experience is a true guru!) when he gives initiation into that technique. In other words, through the practice of a certain asana, for example, the yogin creates a link between his own microcosm, vibrating now on a certain energy (corresponding to that asana), and the macrocosmic source of that energy (or the cosmic correspondent of that asana). Through this link (or resonance), the energy from the cosmic source is ‘poured’ into the practitioner’s microcosm. The more that asana is effortlessly maintained with the necessary mental concentration, the more that type of energy is accumulated into his being. This is the reason all truly advanced yogin-s maintain asana-s, or meditate, or do pranayama, etc., for hours at a time (NOT recommended to beginners!). Therefore, yoga puts at our disposal not only an instrument for self knowledge, but also a large spectrum of tools to develop those areas of our being that are less developped, so that we become whole, complete beings. In the light of the Law of Resonance and due to their similitude, the phenomena, ideas, feelings, objects, energies, etc., are in agreement (consonance, concord), vibrate in unison (identity), evoke (summon) each other selectively through action at a distance. In classical physics, resonance is well known in mechanics, acoustics, electromagnetism. This phenomenon though characterizes the entire manifestation of the Universe. The basis of existence of resonance is the energetic and vibratory substratum of the Universe. Therefore, a first step in deeply understanding resonance is to ponder upon the fact that all physical, mental and spiritual phenomena are rooted into (are a result of) (develop from) a Unique Eternal Reality. The whole Universe is made of lots of things and phenomena, from the smallest atoms to the greatest galaxies. Their common element is that they are all moving. WHY everything is moving is a question to which modern science has no answer. Modern science has however made some progress in explaining HOW things move. Modern (quantum) physics states the existence of FOUR FORCES (assuming as a hypothesis the necessary existence of a FIFTH FORCE which unifies the first four). This theory is a rediscovery of the eastern theory of the five tattva-s (or subtle principles – ‘earth’, ‘water’, ‘fire’, ‘air’, ‘ether’). According to physics, the four forces who act in the Universe are: the ’strong’ and the ‘weak’ forces (who keep atoms together), the force of gravity (who describes the movement of bigger material bodies) and the electromagnetic force (such as light). All these four forces have something in common:they all move in ‘waves’. The propagation of light, for example, is sometimes explained as a flux of particles (photons – a quantum of electromagnetic energy) moving through space. But certain experiments produced results that cannot be explained if we consider that light is just a flux of particles. The fundamental element here is that even in these cases light nevertheless moves through space. Searching for a more comprehensive model, at least in the case of light propagation, we can ask ourselves if there is also something else, besides particles, who can move from one place to another. The answer is yes, there is. If we throw a stone into a pond, we can see it: A WAVE. For understanding easier this principle, let’s analyze a one-dimensional vibration. Let’s suppose that we have a chord placed between two fixed points (fig. 1a). If we stretch the chord at its middle point and then let it go, the chord will start to oscillate and it will produce two symmetrical curves. If we stretch the chord at a quarter of its length and then let it go, the chord will start to oscillate and it will produce the effect shown in fig. 1b. This effect is called stationary (or standing) wave. Standing waves manifest only when the chord is acted upon at distances that divide its wavelength in integer parts. In fig. 1a, the length of the support is half a wavelength (therefore, nodes are identical with the two fixed points). In fig. 1b the length of the support is one wavelength. We notice in fig. 1b that the point N is static and remains so during the whole oscillation of the chord. This point is called a node. 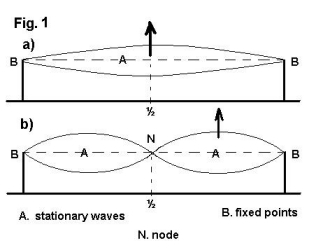 Nodes are points that do not move along a chord in stationary vibration. Let’s suppose now that we have a thin metal plate that we fix on one side like in fig. 2. We will spread on this sheet of metal a uniform and very thin layer of fine sand. Then we stroke one side of the metal sheet with a violin bow, until a sound is produced. As a result of the sound, the plate of metal will start to vibrate. We will notice then that the layer of sand will make certain shapes that are symmetrical. This shape is a result of the stationary waves created in the sheet of metal as a result of its vibration. This is a bi-dimensional replica of the previous experiment. In this case, the sand accumulates in those areas where the metal plate does not vibrate (nodes) – in other words, the sand particles will accumulate in the points with the lowest energy. Therefore, the stationary waves divide the metal plate in an integer number of wavelengths. The dimensions of the metal plate are important in creating these stationary waves and therefore the nodes with low energy. When a certain structure enters in resonance (which means that at that time that structure vibrates on a certain frequency that is specific to that structure only and which can be maintained with least effort) this process of resonance will immediately produce stationary waves. We can continue and visualize the same phenomenon in three dimensions. 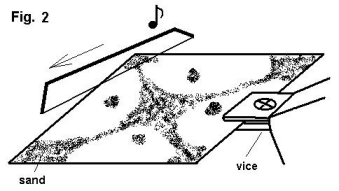 Let’s say we have a glass cube full of a certain liquid in which tiny particles are in uniform suspension (see fig. 3). By making all six sides of the cube vibrate simultaneously, we will notice that the particles in suspension will accumulate in certain areas (nodes) giving birth to symmetrical 3D shapes. This looks very much alike to the structure of a crystal. In this case we created a system of 3D stationary waves. We can say that these stationary waves are in fact the sound of that 3D structure (this shows that there is a direct link between form and sound). The stationary waves created order in a substance that had no definite form (it was amorphous). When a vibration energizes a substance, it will produce certain zones of ‘fullness’ and of ‘emptiness’, in other words zones which have the nature of a particle (nodes) and zones that have the nature of a wave (energetic field). This complementarity wave-particle is a fundamental duality of the whole manifestation. If we look carefully at waves in a pond, we observe that even though water moves up and down in a wave, it (water) does not advance (it stays in the same place). This becomes even more clear if there is a little piece of wood floating on the water: the wood moves up and down, but does not go anywhere. In other words, a wave can travel long distances, but water stays where it was before. Therefore we can say that a wave is a perturbation (disturbance) that propagates through a medium. The medium though does NOT advance in the direction of the disturbance. A wave is something that can travel from one place to another without being a material particle or a flux of particles. Waves manifest in all phenomena of the Universe, from the everyday noises, whose frequencies are from a few hertz to tens of thousands of hertz, to the radio waves, whose frequencies are between 500 and 15,000 million hertz, to the cosmic radiations, whose frequencies are over 1 followed by 22 zeroes hertz! The mental and psychic waves have even greater frequencies, but the nature of these vibratory processes is similar. Their frequencies depend on the quality and refinement of our thoughts and feelings (for example the frequency of a feeling of love is much higher than the frequency of a feeling of sadness). According to Dr. Arnaud, a French scientist, all vibrations of the physical world are between almost zero and 1 followed by 22 zeroes hertz. This represents the lower octave of the Universe (physical world). According to the same scientist, the vibrations of the astral and mental world are between 12 followed by 32 zeroes and 96 followed by 39 zeroes hertz! In the eastern tradition it is known that these frequencies continue to rise as we access higher levels of manifestation. The vibratory energies are classified according to a scale of vibratory levels described by their frequency of vibration. The frequency defines the quality (type) of the energy. The amplitude defines the quantity of the energy. The vibratory frequencies are dependent on the inherent (intrinsic – existing as an essential constituent or characteristic) properties of the emitter or receiver. Thus, for example, the vibratory frequencies received by the ear are between 16 and 20,000 cycles/second. The eye receives vibrations between 1 followed by 14 zeroes and 1 followed by 15 zeroes cycles/second, etc. In this way, every sense organ functions and can interpret only certain determined frequencies. The range of perception of the five senses is extremely limited compared to the whole range of the frequencies in the Universe. Besides the five sense organs, the human being has also other senses (receivers of vibratory energy), which most of the time are latent (dormant)(for example, clairvoyance), but which can be awakened through appropriate training. In vibratory terms, consciousness is the aptitude of a system to respond to stimuli (information). This system can be complex (for example a human being) or very simple (for example a cell). If we will hit an atom with a ray of energy, the atom will respond in a certain way. When we stop this stimulus, the atom comes back to its initial state. This response is a manifestation of the consciousness of the atom. Since the human being is an epitome of the Universe, the number of possible responses increases enormously. We will say that the number of possible responses represents the ‘quantitative’ aspect of consciousness. Maybe to some this will seem artificial, because most people associate the idea of consciousness with living beings only. This happens because of our limitation and ignorance. We restrict the meaning of the term ‘living being’ only to those beings that can reproduce themselves. An intelligent person can see that this vision is totally arbitrary, because what we are doing is to project our own behavior to other systems and judge them according to our ’standards’. According to those ’standards’, atoms, for example, are not alive, just because they do not exist and behave like us! The eastern wisdom defined thousands of years ago the concept of spanda (vibration or flashing forth of the Divine Consciousness), as being the fundament of the entire manifestation of the Universe. In this vision, consciousness is everywhere, even in the most insignificant particle of matter. In other words, the whole matter contains consciousness (therefore, life) in various proportions. The power that is hiding the consciousness of everything that exists, in various degrees, is called maya or the veil of illusion. This degree of the presence of consciousness represents the ‘qualitative’ aspect of consciousness, and this aspect is expressed by the frequency of vibration. The ancient eastern sages, as a result of their personal experimentation at the deepest levels of consciousness, structured the human being and the Universe in seven octaves of vibration (corresponding to the seven cakra-s). These levels express precisely the quality of consciousness. A system has also an activity of energetic exchange with its surrounding world (metabolism). This activity shows the intensity and range of the energetic exchanges between a system and its environment. If this energetic activity does not extend over a certain range of frequencies, the reality corresponding to those frequencies ‘does not exist’ for that system! Therefore there is in nature a specter of relative realities for every category of system that manifests a certain level of consciousness. We can understand now that even a stone has its own consciousness, therefore its own relative reality. The beings from the superior levels of the Universe can interact with their surroundings to a much greater extent than can beings from lower levels. As we rise to a superior level of existence, the magnitude of the reality experienced and our freedom grows exponentially. In order to explain the nature of the Absolute and of the relative aspects of the Real, we will make an analogy, which must not be taken literally, since the Absolute is indefinable. Let’s imagine an endless and extremely deep Ocean. The surface of the water is so peaceful and calm that is almost invisible. This is the reference, the basis of all comparisons. Let’s imagine now that on the surface of the ocean suddenly appear waves which create vibrations. These vibrations make the almost invisible surface of the water to become visible. Analogically, when a vibration is produced in the Absolute, It becomes manifest, visible. We call this ‘relative reality’. The thing that must not be forgotten is that the ocean is the unifying element which penetrates and harmonizes all relative realities. This is why the Ocean can be called Absolute Existence or Pure Consciousness. We can produce waves at the surface, but the more profound levels will never be disturbed. They will forever be in a state of peace (calm). We can say that big and noisy waves (low frequency) correspond to the lower levels of relative reality, and the fine and quick ripples (high frequency) correspond to the higher levels of manifestation. If we will ask a quantum physicist what is an electron made of, he will answer that an electron is a pattern of waves who vibrate at a certain frequency which determines its energy. But if we will ask the physicist WHAT is that which vibrates, he will answer ‘nobody knows’. Using the analogy with the ocean, we can say that the electron is a wave on the surface of the ocean. This wave vibrates in comparison with the deep, still levels of the Pure Consciousness. Therefore we will be able to answer to the question WHAT vibrates in an electron by saying that a unit of pure consciousness vibrates there. When we understand that Reality is made of two aspects: one is the bottom of the ocean and the other is the surface which vibrates, we realize that spirit and matter emerge from the same fundamental essence. The solid matter is expressed as the big, slow waves at the surface of the ocean (low frequency, big amplitude, which is a more restricted manifestation of the consciousness), whereas the mind, for example, is like a very fine and quick ripple (high frequency, small amplitude, which is a more intense and free manifestation of consciousness). Going deeper into this analogy, we can define the Absolute as being an infinitely delicate vibration of practically zero amplitude and infinite frequency. In this situation, we have a perfectly calm surface which contains a tremendous energy. We call this energy ‘creative potential’. This very powerful and extremely refined energy is also endowed with wisdom, which confers to every system an aptitude of auto-organization (can function as a whole). The more reduced the amplitude, the higher the energy (frequency) and the closer the peaks of the vibratory wave. When the vibrations become so fast and the peaks are so close as to become identified with each other, a ‘quasi-static’ state is attained, in which the movement remains potential. Then the energy of the system becomes infinite. Therefore, the Absolute is a state in which the opposites (peak and valley) become one. Thus, movement and rest fuse into one. The Absolute crowns the hierarchy of the relative realities, being in the same time their source. In his non-manifested form, the Absolute is a potential dynamism, whereas once manifested he becomes the source and foundation of the entire Universe, from the physical matter to the most subtle realities. The idea of a supreme vibration as a foundation of the universe is common to many traditions of spirituality. The Gospel of John says “At the beginning there was the Word”, referring to the sonorous vibration of the creative Logos. The eastern philosophies, expressed in numberless legends and myths, talk aboutShiva as the Cosmic Dancer – Shiva Nataraja – who in the rhythm of His dance is creating and destroying the entire universe. The dance of Shiva is an admirable metaphor of existence as it is understood by modern science: a continuous movement on an infinite spectrum of frequencies. In conclusion, we can look upon the entire creation as being an aggregate of vibratory phenomena, each having its own frequency. If we think that sounds are also frequencies, and that any vibration produces a sound, we can say that the entire creation is a grandiose symphony (the music of the spheres). In this world of vibrations, RESONANCE is therefore the paramount phenomenon who links two or more vibratory compatible processes. In acoustics, resonance happens when an elastic body starts to vibrate due to a sonorous signal (sound) that is produced close to that body. In electromagnetism, we call resonance the superimposing of two frequencies of identical characteristics (same wavelength). When the two identical frequencies superimpose, the resulting wave is amplified. This amplification can reach very high values, called points of resonance. Therefore, resonance has as main effect the amplifying of the intensity or amplitude of a sound or radiation. We saw that a wave is always born by something that moves. Light waves, radio waves, ocean waves, gravitational waves, sonorous waves, mental waves, or any other kind of waves, they all exist and manifest because somewhere, something is moving. Nothing can move in one place without inducing sooner or later another movement in another place of the Universe. A wave makes those things that are in its way move in a way similar to the initial movement who generated the wave. If two waves ‘push’ an object in the same direction, the object will move faster in that direction. If two waves push an object in opposite directions, the object will move slower. If the direction of the two waves make an angle, the object will change direction, etc. In fact, in these cases the waves do not actually affect each other, they just interfere with each other. The phenomenon of interference is happening continuously in the world of waves. 1- If the waves have equal frequencies and same period, they amplify each other (RESONANCE or CONSONANCE). 2 – If the waves have equal frequencies and opposite period, they work against each other (DISSONANCE, DISCORD). 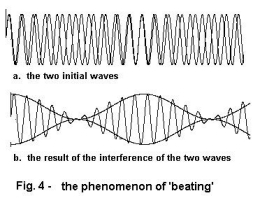 3 – If the frequencies are close, but not equal, they produce the phenomenon of BEATING. The beating is a result of a periodical interference, in other words, sometimes the waves amplify each other, sometimes they work against each other. The resulting wave is a modulated wave, whose frequency will be the difference between the two initial frequencies. 4 – If the frequencies are very different, they do not influence each other at all. Any object that moves periodically can be considered an oscillator. 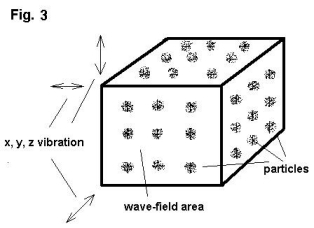 Oscillators modify their environment (for example air, water, gravitational field, etc.) by creating waves. Let’s say we have two violins tuned up identically. We put the two violins on the table, and on one of them we produce a sound by vibrating one chord. We will notice that on the other violin (which we did not touch) the corresponding chord (which therefore is tuned to the same frequency) will also start to vibrate, producing a sound similar to the sound produced by the first violin. This is a phenomenon of resonance. The two violins make up a resonant system. These phenomena of resonance can be very well ascribed to our inner world of thoughts, feelings and emotions as well as to our way to associate with other people and with our surroundings. Thoughts, feelings, ideas, etc., attract, evoke and amplify each other through resonance. Those thoughts/feelings that do not have equal frequencies do not influence each other. And those thoughts/feelings that have opposite frequencies tend to cancel each other. 1. An outburst of growing anger between two people is a manifestation of the phenomenon of resonance. The person who gets angry creates waves of anger who spread into his surroundings. In this way, his anger will be easily transmitted to the other person. If this other person accepts these frequencies in his aura, he will get angry too, producing waves of the same frequency, who will influence the first person through resonance, amplifying his anger. In this way, as long as they are together, their anger will grow continuously. 2. Two people who agree on a subject are attracted to each other, because they resonate. 3. A very important aspect of resonance is the group resonance. In this case, if a group of people are synchronized and think or feel the same thoughts/feelings, the power of those thoughts/feelings is greatly amplified. This phenomenon is very obvious in healing circles, where a group of people are synchronized and send energy (which is amplified through resonance) to one person who needs help. In this way, the participants do not need to be very powerful or skilled, because their efforts, however clumsy, will add and will amplify through resonance, creating a noticeable effect which otherwise may not have been obtained by a single individual. Resonance is a link. The way to create this link is codified in the various techniques or ‘modus operandi’ of the various spiritual paths. He who understands deeply the law of Resonance has found the core of all ways to approach all the dimensions of the Universe.